Not Just Snacks always seemed a strange name for a restaurant to me. I'd seen Not Just Spices across the way and was curious to see what else, other than Indian spices, they had, but really had no desire to try the dining experience across the street. The place doesn't seem entirely welcoming, nor does the name. But then I started hearing that it had great, inexpensive Indian food. I didn't hear a bad comment from anyone I asked. So, Friday night, Andy and I decided to try it. We went in and were struck by how bland the place was. There were only two other people in the whole place, so it seemed very quiet and the neon lighting made it feel like an abandoned cafeteria. Once we sat down and were served our waters in tin camping cups, the place started to fill up. People had bottles of wine or six-packs of beer in their hands (we had forgotten the place was BYOB! a beer would have been so great with our meal!) and the place became more lively. It was a little too fluffy and doughy to my liking. 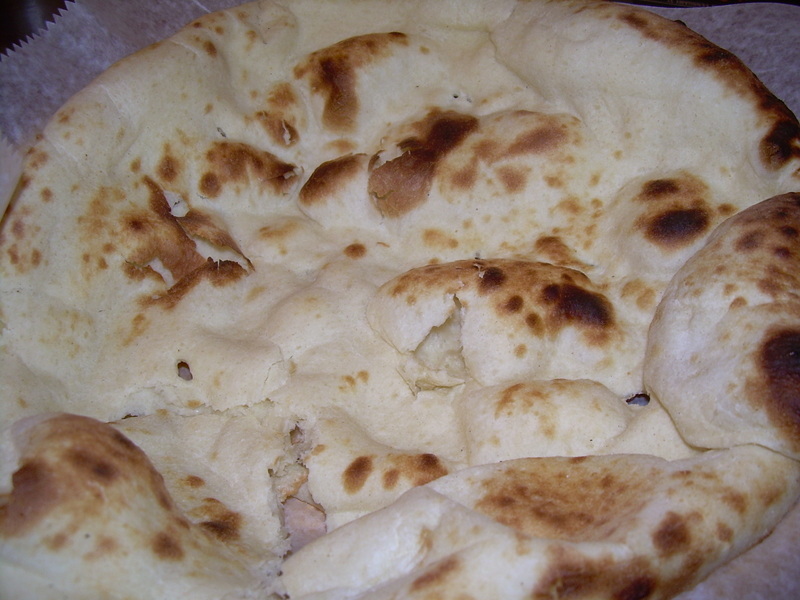 I prefer my naan flatter and fairly crispy, but I ate it and enjoyed it anyway! Such a pretty dish with some great spicy flavors. Karahi is a curry with onions and bell peppers, and we tasted in the curry itself some cilantro and scallions which were tasty and fresh. 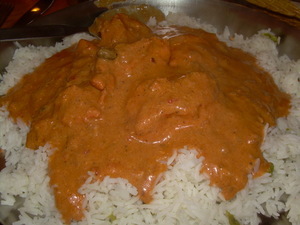 I had my favorite, Chicken Tikka Masala. It probably is my favorite because the sauce is an Indian version of tomato soup! They serve their dishes with a great heap of delicious basmati rice (also in a tin camping style plate) so I poured my chicken on top and scraped out all the sauce from the bowl. Andy and I both loved our dishes. They had a lot of distinguishable Indian spice and the portions were not skimpy for the $8.95 price. I even warmed up to the naan a bit after it was soaked in the tomato and yoghurt sauce. We will definitely be returning, either to sit down or take-out- I really want to try their samosas! Not Just Snacks is delicious! Just FYI, though ,those aren't "tin camping cups." Indians traditionally eat with stainless steel cups, bowls, etc. This just makes the restaurant all the more authentic! 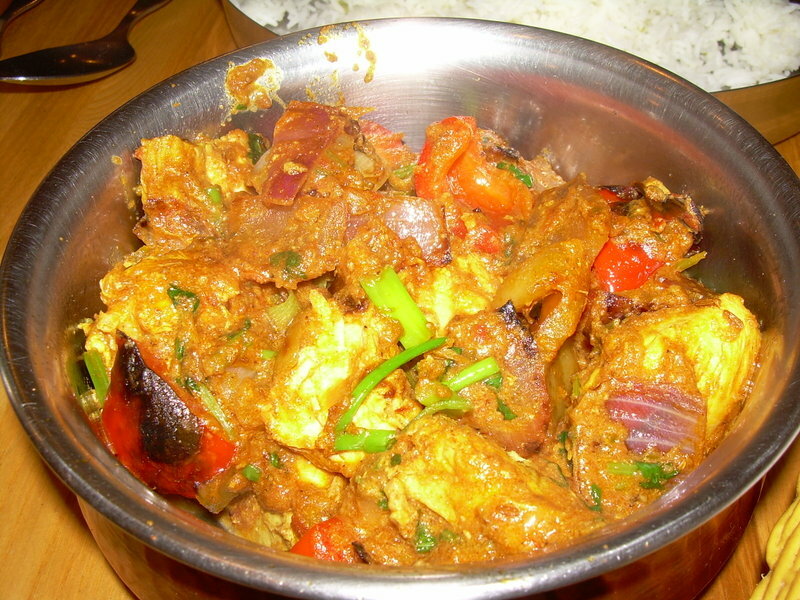 Indians traditionally eat with stainless steel cups, bowls, etc. This just makes the restaurant all the more authentic!